We assess the developing shift in fiscal policy and conclude that it is near-term bullish for growth and bearish for rates. The recently published Budget of the United States, Fiscal Year 2019 introduces a large increase in government spending and cuts in taxes. The net effect of these changes introduces a very large swing in the government deficit this year and next. The deficit is expected to increase to 4.7% of gross domestic product from 3.4% in 2017, and this assumes the economy expands at a 3% clip, substantially faster than the 2% pace we’ve become accustomed to. To put a 4.7% deficit in perspective, the only other times this sized deficit was run was during periods of economic hardship or crisis. The graph below charts the size of the annual deficit over the past 90 years. 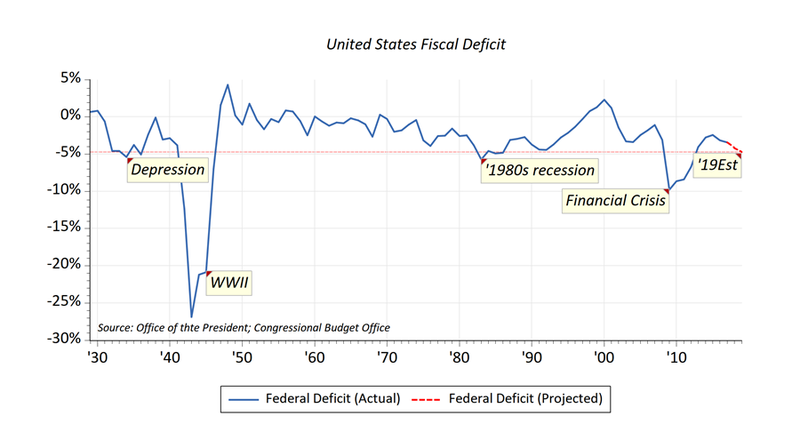 Notice that the projected 2019 deficit was only exceeded in size by the Great Depression, World War II, the severe recession of the early 1980’s, and the 2008-2009 Financial Crisis. The turnabout in the direction of the deficit comes late in an expansion and not during a cyclical trough, and represents a likely push in demand against an economy that is already nearing full capacity. All else being equal, the shift in fiscal stance this late in the cycle is likely to cause market participants to begin to anticipate higher real growth, rising inflation pressures, higher short-term rates, and higher corporate earnings. The budget proposes nearly $400 billion of additional spending in addition to the stimulative effects of the already enacted tax cut. We are somewhat surprised by the size and timing of the shift in policy because it sets out a path for a widening deficit that is much higher than the administration initially expected. The increased deficit has the potential to further stoke confidence and impart a near-term push to growth and profit expectations. Ultimately, we think this is best viewed as a pro-cyclical shift that pulls forward demand, potentially extending the cycle and further lifting expectations that drive risk assets. A potential risk of starting a fiscal push at this point is the unhinging of interest rate expectations. Should markets decide that the expected increase in demand will push against resource constraints and unleash rising consumer prices, or if rising growth expectations feed further increases in asset values, it could pressure the central bank to accelerate interest rate hikes. Given over a decade of easy monetary policy, it is hard to anticipate how the economy or financial markets might adjust to a sudden tightening shift from the Fed. Either way, the newly released budget outlines a path toward an unusually timed, significant shift toward a fiscal expansion by the federal government. The change is significant and has the potential to shift near-term growth and interest rate expectations higher. Longer-term issues including the financing and sustainability of the deficit, along with implications for policy options in the event of a future downturn, are relevant but more likely to be dealt with by markets further on down the road. With near-term growth still on track and rates moving higher, we sticking with our tactical overweight to U.S. equities versus core bonds.